Finding the potential acquisitions, having a source of capital, and possessing negotiation savvy are all important elements when buying a business. However, people often overlook the attitude of the buyer and how greatly it can affect the outcome of the deal. Confidence is key. The buyer demonstrating that they are qualified to run the business is crucial to completing a deal, because a seller, who has poured their life into building their business, will want to be assured that they are leaving it in good hands. A balance between confidence and an understanding of what it truly takes to run a business is needed to close a deal. Confidence that borders on arrogance will put off a seller, since they are well aware of the difficulty of managing their business and will not want to feel belittled. A seller will be able to see through a buyer that is overconfident in their skills. While attitude is important, so is a solid background in business. The best way for a buyer to ensure that they have an adequate understanding of the business is to learn as much as they can about the company before making an offer and perform thorough due diligence. 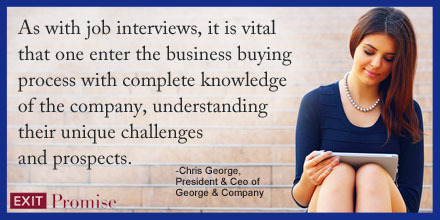 As with job interviews, it is vital that one enter the business buying process with complete knowledge of the company in question, understanding their unique challenges and prospects, and be able to indicate this to the seller. Observe the attitude of the seller as well. Do they seem that they have lost faith in the business? Are they itching to get it off their hands, or are they struggling to let go? Both of these emotions can have their pros and cons. A seller that wants to abandon their business as quickly as possible could see some potential faults of which the buyer is not yet fully aware. On the other hand, they could simply be burnt out and all that the business needs is some new management to become even more successful than it has been in the past. If the business owner is hesitant about selling their business, it does not always indicate the health of the business either. It could be that it is failing and they are not quite willing to admit this fact to themselves . On the other hand, they could also be burnt out but feel that the potential is still there, which is why they have made the difficult decision to sell. Attitude is everything but sometimes it can be difficult to put into definite terms without a bit of intuition. It is important to examine the attitudes of the company’s clients as well. Are they completely loyal to the business owner, and is there a potential for them to leave once the company changes hands? Are they disenchanted with the direction that the business has gone, and is there still a possibility to turn this around? Understanding the customer base is vital to determining the viability of a target.